Space, sailing and living comfort and access to the sea afforded by the novel concept aft cockpit access to a standing-height lazarette with side platform convinced this long time sailing yachtsman to build a 50m Perini to embark on a three year circumnavigation at the turn of the century. 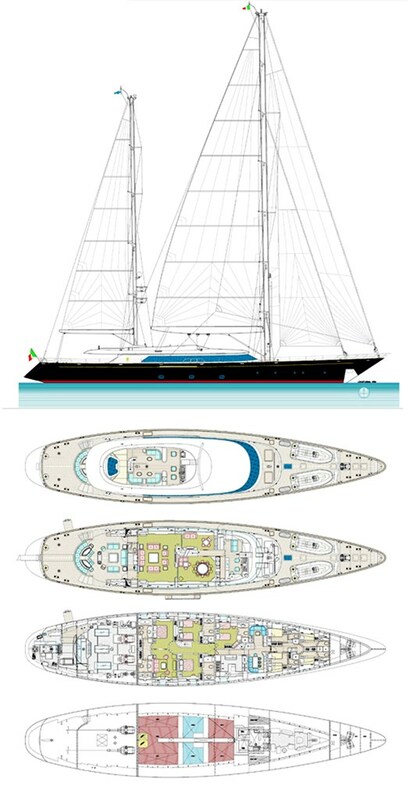 The adventure would culminate with participation at the Perini Navi Cup – setting the scene for the family’s next Perini, the racing 38m P2. Built in 2001, she was extensively refit in 2012 at the Perini shipyard, with chic interior styling by the renowned French designer Christian Liaigre. From the crisp linens and leather accents to the refined neutral colours, Silencio’s sumptuous living spaces define effortless elegance. Despite her immaculate style, she allows for all manner of relaxation and fun when on board with spacious lounging areas in the sun and shade, fantastic audiovisual equipment, and an array of water sports equipment. Her outstanding outdoor spaces include a typical "Perini-style" aft cockpit with protected lounging and dining, as well a large and comfortable fly-bridge.